Corticosteroids have a broad spectrum of biologic action, including down-regulation of inflammatory cytokines, endothelial adhesion molecules, and growth factors such as VEGF, giving this class of drug antiinflammatory, anti–vascular permeability, and antiangiogenic effects, respectively.4 These molecular mechanisms are dysregulated in many vitreoretinal diseases to varying degrees, making corticosteroids effective treatment options for a number of disease states. However, not all corticosteroids are the same, and their varying chemical structures result in different clinical properties. Triamcinolone is minimally water-soluble and becomes a depot of crystals that release steroid, resulting in a long half-life.5 Conversely, dexamethasone has two additional hydroxyl groups in the acetonide functional group, making it significantly more hydrophilic compared with triamcinolone and fluocinolone.6 Water solubility has two benefits: a shorter half-life, which makes it amenable as a sustained-release medication by allowing controlled and steady release6; and less aggregation onto ocular structures such as the trabecular meshwork,7 which appears to result in lower rates of intraocular pressure (IOP) elevation. When using intravitreal corticosteroids in our practice, we ensure that patients have a clear understanding of the risk for cataract progression and possible ocular hypertension. We find that patients are less concerned about cataract, viewing cataract surgery as a matter of when rather than if. Most patients are accepting of drops for ocular hypertension, but glaucoma surgery is always an undesirable course. Among the various intravitreal steroid options, the dexamethasone intravitreal implant has a favorable IOP profile. In the MEAD trial, incisional glaucoma surgery was required in 0.6% of patients with DME treated with the 700-μg dose of the dexamethasone intravitreal implant.1 By comparison, 33.8% of patients treated with the 0.59-mg fluocinolone acetonide implant (Retisert, Bausch + Lomb),8 4.8% of patients treated with the 0.19-mg fluocinolone acetonide implant (Iluvien, Alimera Sciences),9 and 1.2% treated with 4.0 mg of intravitreal triamcinolone10,11 required incisional glaucoma surgery in the respective large clinical trials evaluating these therapies in patients with DME. As reflected in the MEAD study results, we find that IOP elevation with the dexamethasone intravitreal implant is mild and predictable. These elevations peak at 6 to 8 weeks after injection and then return to close to baseline by 3 or 4 months.1 In our practice, we have not experienced the so-called staircase progressive IOP elevation with repeated injections as is sometimes seen with triamcinolone. IOP elevation with triamcinolone also appears to be less predictable in terms of timing (several days to many months)12 and severity (between 70-80 mm Hg).13-15 On the other hand, 89% of patients who developed ocular hypertension at any point during the MEAD trial did so within the first three injections, and 99% of patients who developed ocular hypertension did so within the first four injections.16 This means that if a patient has not demonstrated an IOP spike by the third or fourth injection, it is unlikely that he or she will do so after future injections. In our practice, we most commonly use the dexamethasone intravitreal implant in patients with DME and RVO who respond poorly to anti-VEGF agents. The literature supports the efficacy of the dexamethasone intravitreal implant as rescue treatment for recalcitrant DME29-31 as well as branch and central RVO.31,32 The controversial question is when to switch to the dexamethasone intravitreal implant—in other words, after how many ineffective anti-VEGF injections do you consider a patient to be a poor anti-VEGF responder? It has been demonstrated that if central retinal thickness does not decrease by at least 25% after the first anti-VEGF injection in patients with RVO, the patient is likely to be a poor responder regardless of the number of injections.33 Similar findings have been reported in DME patients (Shah AR, et al, unpublished data). We are therefore comfortable switching to the dexamethasone intravitreal implant relatively early, and these patients often respond well (Figure). Figure. The efficacy of the dexamethasone intravitreal implant for DME with poor response to anti-VEGF agents is illustrated. The patient’s eye had previously undergone vitrectomy for nonclearing vitreous hemorrhage (A). DME was treated with ranibizumab 0.3 mg (Lucentis, Genentech; A). There was a subtle response seen 5 weeks after injection (B). The patient returned after 11 weeks with worsening intraretinal fluid (C). Aflibercept (Eylea, Regeneron) was administered. There was minimal response seen after 6 weeks, and another aflibercept injection was used (D). There was worsening of edema 8 weeks subsequently, and the patient was switched to the dexamethasone intravitreal implant (E). The edema acutely resolved for the first time, seen 7 weeks after injection of the dexamethasone intravitreal implant (F). There was mild intraretinal fluid on follow-up examination 8 weeks later, and aflibercept was administered (G). The edema worsened 8 weeks later, and it was decided to resume treatment with the dexamethasone intravitreal implant (H). The edema resolved 8 weeks subsequently (I). The patient remains on the dexamethasone intravitreal implant every 3 to 4 months on an as-needed basis, demonstrating excellent control of edema for more than a year. The dexamethasone intravitreal implant and the two fluocinolone acetonide implants are all sustained-release devices, but they differ in their durations of action. The fluocinolone implants were designed to last for 3 years. Significantly fewer injections are required, but, once the implant is placed, the eye is committed to potentially 3 years of steroid exposure and accompanying IOP complications. On the other hand, the dexamethasone intravitreal implant, while initially designed to last for 6 months, usually provides clinically meaningful effects for 3 to 4 months based on our experience with refractory edema. The drawback of requiring more injections becomes an advantage when managing IOP issues, because the steroid effects subside sooner. Yoshihiro Yonekawa, MD, is a second-year vitreoretinal surgery fellow at Associated Retinal Consultants/William Beaumont Hospital in Royal Oak, Mich. He reports no conflicts of interest. Dr. Yonekawa may be reached at yoshihiro.yonekawa@beaumont.org. Jeremy D. Wolfe, MD, is a partner at Associated Retinal Consultants, Royal Oak, Mich., and assistant professor of Ophthalmology at Oakland University William Beaumont School of Medicine. He is a consultant for Allergan, Alimera, and Genentech. Dr. Wolfe may be reached at jwolfe@arcpc.net. 1. Boyer DS, Yoon YH, Belfort R, et al. Three-year, randomized, sham-controlled trial of dexamethasone intravitreal implant in patients with diabetic macular edema. Ophthalmology. 2014;121:1904-1914. 2. Haller JA, Bandello F, Belfort R, et al. Dexamethasone intravitreal implant in patients with macular edema related to branch or central retinal vein occlusion twelve-month study results. Ophthalmology. 2011;118:2453-2460. 3. Lowder C, Belfort R, Lightman S, et al. Dexamethasone intravitreal implant for noninfectious intermediate or posterior uveitis. Arch Ophthalmol. 2011;129:545-553. 4. Kuppermann BD, Zacharias LC, Kenney MC. Steroid differentiation: the safety profile of various steroids on retinal cells in vitro and their implications for clinical use (an American Ophthalmological Society thesis). Trans Am Ophthalmol Soc. 2014;112:116-141. 5. Sobrin L, D’Amico DJ. Controversies in intravitreal triamcinolone acetonide use. Int Ophthalmol Clin. 2005;45:133-141. 6. Kurz PA, Suhler EB, Flaxel CJ, Rosenbaum JT. Injectable intraocular corticosteroids. In: Becker MD, Davis J, eds. Surgical Management of Inflammatory Eye Disease. Philadelphia; 2008:5-16. 7. Thakur A, Kadam R, Kompella UB. Trabecular meshwork and lens partitioning of corticosteroids: implications for elevated intraocular pressure and cataracts. Arch Ophthalmol. 2011;129:914-920. 8. Pearson PA, Comstock TL, Ip M, et al. Fluocinolone acetonide intravitreal implant for diabetic macular edema: a 3-year multicenter, randomized, controlled clinical trial. Ophthalmology. 2011;118:1580-1587. 9. Campochiaro PA, Brown DM, Pearson A, et al. Sustained delivery fluocinolone acetonide vitreous inserts provide benefit for at least 3 years in patients with diabetic macular edema. Ophthalmology. 2012;119:2125-2132. 10. Diabetic Retinopathy Clinical Research Network. A randomized trial comparing intravitreal triamcinolone acetonide and focal/grid photocoagulation for diabetic macular edema. Ophthalmology. 2008;115:1447-1449. 11. Diabetic Retinopathy Clinical Research Network (DRCR.net), Beck RW, Edwards AR, et al. Three-year follow-up of a randomized trial comparing focal/grid photocoagulation and intravitreal triamcinolone for diabetic macular edema. Arch Ophthalmol. 2009;127:245-251. 12. Lauer AK, Bressler NM, Edwards AR, Diabetic Retinopathy Clinical Research Network. Frequency of intraocular pressure increase within days after intravitreal triamcinolone injections in the diabetic retinopathy clinical research network. Arch Ophthalmol. 2011;129:1097-1099. 13. Quiram PA, Gonzales CR, Schwartz SD. Severe steroid-induced glaucoma following intravitreal injection of triamcinolone acetonide. Am J Ophthalmol. 2006;141:580-582. 14. Ansari EA, Ali N. Intraocular pressure following intravitreal injection of triamcinolone acetonide. Open Ophthalmol J. 2008;2:119-122. 15. Jain S, Thompson JR, Foot B, et al. Severe intraocular pressure rise following intravitreal triamcinolone: a national survey to estimate incidence and describe case profiles. Eye (Lond). 2014;28:399-401. 16. Singer M, for the Ozurdex MEAD Study Group. Intraocular pressure in patients with diabetic macular edema treated with dexamethasone intravitreal implant: MEAD study findings. Presented at: the American Society of Retina Specialists Annual Meeting; August 9, 2014; San Diego, CA. 17. Dutra Medeiros M, Navarro R, Garcia-Arumí J, et al. Dexamethasone intravitreal implant for treatment of patients with recalcitrant macular edema resulting from Irvine-Gass syndrome. Invest Ophthalmol Vis Sci. 2013;54:3320-3324. 18. Khurana RN, Palmer JD, Porco TC, Wieland MR. Dexamethasone intravitreal implant for pseudophakic cystoid macular edema in patients with diabetes. Ophthalmic Surg Lasers Imaging Retina. 2015;46:56-61. 19. Bellocq D, Korobelnik J-F, Burillon C, et al. Effectiveness and safety of dexamethasone implants for post-surgical macular oedema including Irvine-Gass syndrome: the EPISODIC study. Br J Ophthalmol. 2015;99:979-983. 20. Bonfiglio V, Fallico MR, Russo A, et al. Intravitreal dexamethasone implant for cystoid macular edema and inflammation after scleral buckling. Eur J Ophthalmol. 2015;25:0-0. 21. Taney LS, Baumal CR, Duker JS. Sustained-release dexamethasone intravitreal implant for persistent macular edema after vitrectomy for epiretinal membrane. Ophthalmic Surg Lasers Imaging Retina. 2015;46:224-228. 22. Bui KM, Chow CC, Mieler WF. Treatment of recalcitrant radiation maculopathy using intravitreal dexamethasone (Ozurdex) implant. Retin Cases Brief Rep. 2014;8:167-170. 23. Caminal JM, Flores-Moreno I, Arias L, et al. Intravitreal dexamethasone implant for radiation maculopathy secondary to plaque brachytherapy in choroidal melanoma [publishied online ahead of print May 27, 2015]. Retina. 24. Srour M, Querques G, Leveziel N, et al. Intravitreal dexamethasone implant (Ozurdex) for macular edema secondary to retinitis pigmentosa. Graefes Arch Clin Exp Ophthalmol. 2013;251:1501-1506. 25. Ahn SJ, Kim KE, Woo SJ, Park KH. The effect of an intravitreal dexamethasone implant for cystoid macular edema in retinitis pigmentosa: a case report and literature review. Ophthalmic Surg Lasers Imaging Retina. 2014;45:160-164. 26. Calvo P, Ferreras A, Adel Al F, et al. Dexamethasone intravitreal implant as adjunct therapy for patients with wet age-related macular degeneration with incomplete response to ranibizumab. Br J Ophthalmol. 2015;99:723-726. 27. Bratton ML, He YG, Weakley DR. Dexamethasone intravitreal implant (Ozurdex) for the treatment of pediatric uveitis. J AAPOS. 2014;18:110-113. 28. Lei S, Lam WC. Efficacy and safety of dexamethasone intravitreal implant for refractory macular edema in children. Can J Ophthalmol. 2015;50:236-241. 29. Dutra Medeiros M, Postorino M, Navarro R, et al. Dexamethasone intravitreal implant for treatment of patients with persistent diabetic macular edema. Ophthalmologica. 2014;231:141-146. 30. Zhioua I, Semoun O, Lalloum F, Souied EH. Intravitreal dexamethasone implant in patients with ranibizumab persistent diabetic macular edema. Retina. 2015;35:1429-1435. 31. Alshahrani ST, Dolz-Marco R, Gallego-Pinazo R, et al. 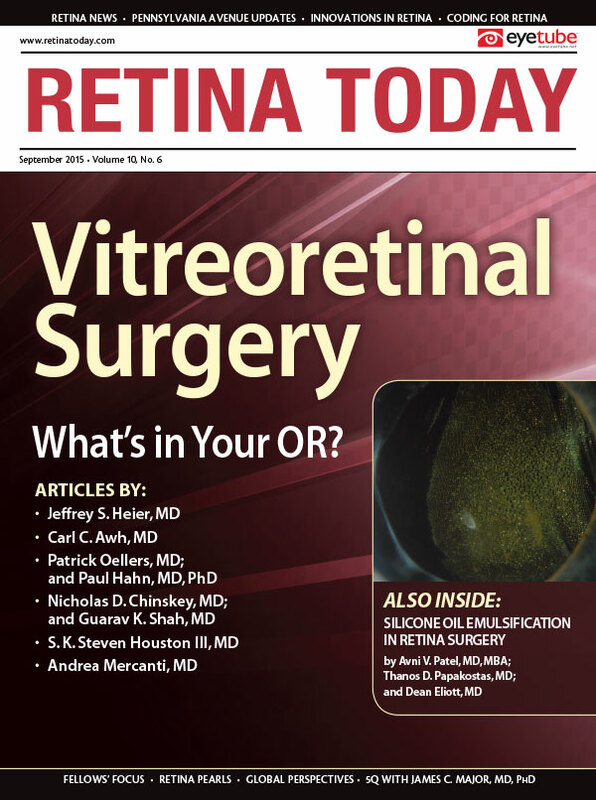 Intravitreal dexamethasone implant for the treatment of refractory macular edema in retinal vascular diseases: Results of the KKESH International Collaborative Retina Study Group [published online ahead of print June 15, 2015]. Retina. 32. Sharareh B, Gallemore R, Taban M, et al. Recalcitrant macular edema after intravitreal bevacizumab is responsive to an intravitreal dexamethasone implant in retinal vein occlusion. Retina. 2013;33:1227-1231. 33. Shah AR, Alfaran A, Abbey AM, Wolfe JD. Early identification of macular edema recalcitrant to intravitreal anti-vascular endothelial growth factor and efficacy of intravitreal dexamethasone implant treatment. Paper presented at: The American Society of Retina Specialists Annual Meeting; August 9, 2014; San Diego, CA. 34. Christoforidis JB, Carlton MM, Wang J, et al. Anatomic and pharmakokinetic properties of intravitreal bevacizumab and ranibizumab after vitrectomy and lenstomy. Retina. 2013;33:946-952. 35. Ahn SJ, Ahn J, Park S, et al. Intraocular pharmacokinetics of ranibizumab in vitrectomized versus nonvitrectomized eyes. Invest Ophthalmol Vis Sci. 2014;55:567-573. 36. Chin HS, Park TS, Moon YS, OH JH. Difference in clearance of intravitreal triamcinolone acetonide between vitretomized and nonvitrectomized eyes. Retina. 2005;25:556-560. 37. Chang-Lin JE, Burke JA, Peng Q, et al. Pharmacokinetics of a sustained-release dexamethasone intravitreal implant in vitrectomized and nonvitrectomized eyes. Invest Ophthalmol Vis Sci. 2011;52:4605-4609. 38. Adán A, Pelegrín L, Rey A, et al. Dexamethasone intravitreal implant for treatment of uveitic persistent cystoid macular edema in vitrectomized patients. Retina. 2013;33:1435-1440. 39. Boyer DS, Faber D, Gupta S, et al. Dexamethasone intravitreal implant for treatment of diabetic macular edema in vitrectomized patients. Retina. 2011;31:915-923. 40. Shaikh AH, Petersen MR, Sisk RA, et al. Comparative effectiveness of the dexamethasone intravitreal implant in vitrectomized and non-vitrectomized eyes with macular edema secondary to central retinal vein occlusion. Ophthalmic Surg Lasers Imaging Retina. 2013;44:28-33.